At this point in my flying career I wasn’t making much progress with my attempt at completing my Famous Artists Course, a correspondence effort with the school in Westport, Connecticut. Lesson 10 of 24 is as far as I ever made it. The desire however never faltered and would haunt me for many years to come. I did not understand why the pursuit, or purpose. Our family had moved from Alameda in the Bay Area, out to Vacaville in the valley, because our flying schedules now required us to originate from both Navy Alameda and McClellan AFB, near Sacramento. Vacaville, located between, was halfway between them and was also near Travis AFB, another Logair cargo stop. While living in Solano County, I discovered a junior college that had a commercial art course that could be attended at night a few days a week. I enrolled. It is here that I met Ray and Donnie Salmon who became lifelong friends. They both taught the classes. Donnie was a freelance book illustrator and Ray was a published cartoonist and former trumpet player. They both shepherded me through several years in their commercial art course, and then later introduced me, to the Academy of Art College in San Francisco. During this period of time the airline industry became somewhat unstable. It began with the Arab Oil Embargo in October of 1973, which created the crisis that limited our nation’s energy supplies severely. All of this the direct result of Egypt and Syria attacking Israel on Yom Kippur, a war in which the US came to Israel’s aid by providing them arms. This era, from 1973 on, seems to me the beginning of a world awareness of the polarized populace in the region, that remains today very complicated. Competition from other airlines for the Air Force Logair and the Navy Quicktrans contracts increased significantly and ONA chose not to compete for as many routes. The decision was made to sell their Electra’s (L-188’s), and to increase the number of DC-8 aircraft, plus adding 3 DC-10’s to the fleet. I ended up transitioning to the right seat of the DC-8 passenger operation based in New York, and I chose to commute from California. There were several earlier incidents that contributed to the strategic long term plans of the airline. The first was the loss of one of our DC-9 aircraft in an accident that never should have happened. Little did I know that almost one year after finishing initial flight training that the very same airframe would be resting on the bottom of the Caribbean Sea, just thirty-five miles short of St. Croix, where it remains today with its fuel tanks empty. The ill-fated flights Captain was an instructor pilot, and former DC-9 chief pilot, whom I’d had my own experience with a year earlier. He was well known among fellow pilots to prefer flying the aircraft below performance capable altitudes. He liked to fly low using long range cruise airspeeds and unfortunately, it is also where fuel is exhausted more readily. One needs to keep in mind this era of jet airliners was in its early stages. Older airline pilots, although well experienced, had graduated into swept wing jets from a totally different set of flight parameters. The jet aircraft was a different animal, unlike the piston aircraft with straight wings; it had the capability to fly high and fast. The aircraft range (its distance capability) was determined by its weight and how high you could get it to climb. The limiting factor was the limitation on wing stall speeds (when the wing no longer is creating lift or stops flying). There are two of those: referred to as the low speed stall, and the high speed stall. As you climb higher the two speeds merge into what was ominously called the “coffin corner,” but the moniker really had no merit. The most efficient altitude for fuel burn rate was in an envelope where there was only a ten knot spread between the low and high speed stall of the wing. It isn’t at all scary if you have been doing it for twenty years. With this short experience level in early jet flying (at higher altitudes), it is easy to understand why some early jet pilots were a bit wary, not to mention loss of consciousness issues with a rapid decompression. The Captain of Flight 980, the ONA flight I am referring to, was perhaps one of those. But, he was also known, by his own admission, as the Cherub-Faced-Assassin. He seemed to take pleasure in flunking his pilot victims. Plus, he operated the aircraft as a one man band preferring to do everything himself. CRM or Crew Resource Management was still a few decades away which was made necessary, within the industry, by pilots such as himself. My personal experience with the Captain of Flight 980 occurred during my initial qualification training with ONA. After my sessions with another flight instructor, I was given over to the cherub-faced-one for a final check-ride. I flunked! But, I have to give him some credit, he was correct in doing so. I learned a very valuable lesson that day. My problem, like so many that come from a pure piston, straight wing background, was my response during takeoff after an engine failure. During the unspooling of the engine, using a simulated engine failure technique (done by retarding the engine throttle to idle), you try to keep the airplane on the center line of the runway using only rudder controlled directional input. My mistake, besides using the rudder, was unconsciously applying a little control wheel steering which deflected the ailerons (and possibly flight spoilers) on the wing. This can be disastrous. A deflected spoiler can affect a wings lift, which they are designed to do, but it’s not something you want happening during a very critical time when trying to become airborne on one engine. The assassin, rightfully so, said he was sending me back to Moose, my original instructor pilot. I have to admit I was a bit teary eyed as I found my way back to a seat in the cabin, thinking I may have flunked out completely as the next guy in line jumped into the co-pilot seat for his date with the check captain. However, not everyone was as lucky as I and in retrospect, it was a very valuable lesson for someone who had never flown a jet. My friend, and fellow new-hire classmate, was the co-pilot on that flight that day, in May of 1970 that ran out of fuel. I have heard the full story from his side of the cockpit. It was a very unusual assortment of circumstances that all came together at once, and for all concerned a sad day, especially the twenty-three people that lost their lives. As far as I know neither the captain nor the co-pilot ever flew for another airline again. Even today, in my opinion, the co-pilot was not treated fairly, especially during the previous year leading up to the accident. The captain took the bait from the tower operator at St. Maartin deciding it would be safe to continue instead of diverting. My guess is seven out of ten pilots in his position would have done the same if only for economic reasons. He knew the airline was losing money every time a fuel stop was necessary. Unfortunately, he suffered the consequences of being pilot in command; which is called responsibility. It was twenty-five years later that I met up again with Harry, my fellow classmate from 1969 ONA. We crossed paths at the American Airlines Flight Academy in the late 1990’s. I was there for recurrent training, a semi-annual requirement for all line captains at US Government Certified Air Carriers. He was there doing a training regimen and was currently employed as a ground school instructor at the FedEx training center in Memphis. We made a date to have lunch the next afternoon to catch up on our lives since ONA. I’d flown in and out of some dark clouds (and sparkling sunshine) during the intervening period since I last saw Harry, some twenty-five years earlier. In relating to him the many airlines I’d flown for since then, he didn’t seem upset that he wasn’t still flying. During this later portion of my aviation career I was heavy into my art and I shared this with him. Harry then mentioned the aviation art located at Simuflite, which was located nearby, and asked if I would like to go have a look after our lunch. I agreed. Simuflite, now CAE Simuflite, is the world’s largest trainer of corporate pilots and crews. 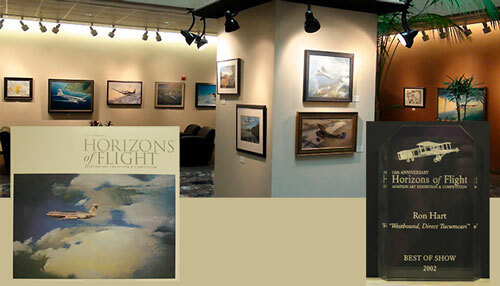 Each year they sponsor an aviation art contest called the “Horizons of Flight, Aviation Art Exhibition & Competition.” It was here that Harry introduced me to my next endeavor. I loved the art I saw and recognized some artists I was familiar with that enjoyed national recognition. I thought to myself then… “I can do this,” and so I did all thanks to Harry. I was by then a signature-member of “The Pastel Society of America” whose annual show was held at the National Arts Club on Gramercy Park in New York. Considering the aviation art genre that Harry had introduced me to, I created a pastel painting of a “Curtiss JN-4” aircraft, commonly referred to as the Jenny. The title of the painting I called “Oh Jenny, Jenny.” It was accepted into their show and to my surprise won an award. I was off to the races. The epilogue to this story: in just a few short years after my encounter with my former friend, the ill-fated copilot on flight 980, was my first participation in CAE Simuflite’s, 2002 “Horizons of Flight, Aviation Art Exhibition & Competition. It was a painting titled “Westbound, Direct Tucumcari” an image of an American Airlines MD-80. The painting won “Best of Show.” Again, thanks to a chance meeting with an old friend. The downward spiral of ONA continued slowly. 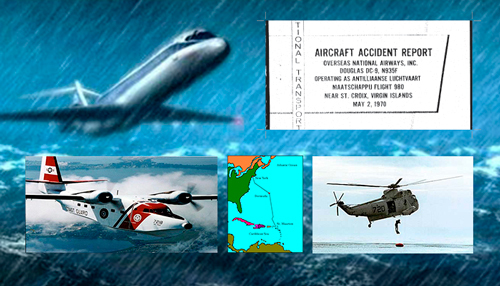 I believe it began a year or two after the loss of the DC-9 in the Caribbean. Then, in November of 1975, we lost our first DC-10 due to a flock of seagulls that were ingested into the right engine during takeoff at JFK. The aircraft came to a halt off the end of the runway where it was destroyed by fire. Everyone got out before the aircraft was consumed in flames. The aircraft, loaded with crew members, 139 flight attendants and pilots, was positioning to Jeddah, Saudi Arabia to participate in transporting religious pilgrims to Mecca during the annual Hajj. Less than two months later we would lose our second DC-10 when our most senior captain landed short of the runway at Istanbul, Turkey, ripping off the landing gear and an engine. The aircraft, carrying 364 Hajj Pilgrims, was destroyed. Fortunately, there were a few injuries, but no casualties on this DC-10 either. During the same Hajj season I was flying our DC-8 Freighter with Captain Jesse Williams. We flew a trip that month that took us completely around the world. Beginning in San Francisco we flew to Montreal and from there Shannon, Ireland. From Shannon we went to Frankfurt and then to Iraklion, Greece and on to Shiraz, Iran from there. We only spent a night at each stop except for Shannon. After a brief stay in Iran we went on to Hong Kong and then Seoul, Korea. The next day we flew to Anchorage and finished our round-the-world excursion back in San Francisco. Jesse and I shared an apartment in Alameda for a short while during the spring of 1976. Being away from home so much had a devastating effect on airline pilot’s marriages and mine was no different. My wife and I had separated during this period and we never got back together. I couldn’t provide what it was she needed. We have maintained a good relationship for the benefit of our son. I was furloughed in the fall of 1976 and was never recalled. I moved to San Francisco and attended the Academy of Art College, my wife and son moved back to Arkansas living with her parents while she went back to college. She earned her teaching degree and eventually became a High School student counselor. My son Ronnie followed in her footsteps and is now teaching high school math in North Little Rock Arkansas. Not long after I was furloughed Jesse Williams, my round the world fellow crew-mate, while flying another ONA Cargo trip as a copilot, was involved in yet another aircraft accident. In 1977 on a night approach to an airport in North Africa, Jesse’s DC-8 hit the ground short of the runway. The Captain and Flight Engineer were killed instantly, Jesse was the only survivor. He suffered a severe head injury and remembers nothing of the accident circumstances. The ONA that I knew stopped operating in October 1978.